Buying an otoscope and ophthalmoscope (often referred to as a “diagnostic set”) is one of the most expensive equipment purchases for a medical student. Thus, you want to buy the best otoscope and ophthalmoscope for medical students (with one exception, the best for medical students also happens to be the best for any healthcare practitioner). 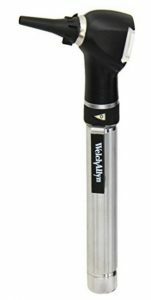 Welch Allyn is the only manufacturer that makes high-quality otoscopes and ophthalmoscopes and is ubiquitous around the hospitals and clinics. They are expensive. That said, it is recommended to buy a Welch Allyn diagnostic set because they are the best out there and will be what you use in the wards and clinics. It will be important that you practice with and become proficient with their models. You will need an otoscope head, and ophthalmoscope head and a handle (which contains the battery to power the light bulb of the otoscope and ophthalmoscope) — buying a complete set is the most economical way of getting all you need. Below we go over the buying considerations for the different otoscope and ophthalmoscope heads and the different handles. At the end, we list a few recommended sets. If you don’t want to waste time reading the buying guide below, this is the most highly recommended set for medical students. Alternatively, if you are still able to buy this set, you can save some money. The otoscope is an essential physical exam tool to visually examine the tympanic membrane and ear canal. It, coupled with an insufflation bulb, is also used to test tympanic membrane mobility. Any of the Welch Allyn models below can be considered the best otoscope for medical students. Find one that is in your price range and run with it. The traditional otoscope head is what comes to mind when you think of an otoscope. 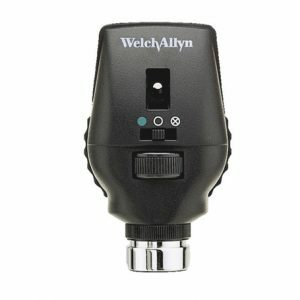 Welch Allyn produces this very high-quality and durable otoscope head that will last you a very, very long time. It is probably the most common otoscope head seen in hospitals and clinics, but it is slowly being replaced by the MacroView head (the Macroview is probably more common at my medical school). 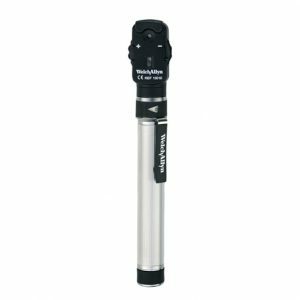 The traditional otoscope is also hard to find as part of a diagnostic set; it looks like Welch Allyn has stopped including it in new sets and has replaced it with the MacroView otoscope. The traditional otoscope head is more than sufficient for what you’ll need, and it is an excellent diagnostic tool. It uses the standard disposable otoscope tips (these are called specula, also discussed below) which are found all over the hospital and clinics. It also comes with either the more traditional Halogen HPX lighting or LED lighting. We discuss the nuances of the different light bulbs below, but the halogen lighting is likely sufficient for your use. with it’s own power source (i.e., if you get the PocketScope Ophthalmoscope and Otoscope set, they each have a handle, so you don’t need to switch back and forth like with the 3.5V power handle). Two, it’s small and can clip into your coat pocket, making it really easy to take with you in your white coat. Three, you hardly sacrifice any quality when visualizing the tympanic membrane. This comes with a 2.5V power handle, halogen lighting and runs on AA batteries. 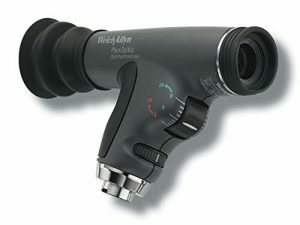 The MacroView otoscope is a more recently released Welch Allyn product. The manufacturers contend that this otoscope lends a greater view of the tympanic membrane and greater magnification than the traditional model: “Twice the field of view and 30% greater magnification than traditional otoscopes.” To be honest, I have used both models extensively (as you will too) and there is not all the much of difference in the visualization capabilities of these two otoscope heads. The ophthalmoscope is the essential tool for a basic eye exam. There are two types of ophthalmoscopes: direct ophthalmoscopes (what you will be using) and the indirect ophthalmoscopes (used by ophthalmologists). Below we go over the few different types of ophthalmoscopes that you can buy. Unlike with the otoscope, there is a fairly big difference in the ease-of-use between the “traditional” older versions and the newer, “wide view” Panoptic ophthalmoscope. Finding the best ophthalmoscope for medical students is a little counter-intuitive. Although the Panoptic is easier to use, it is best to learn on an older model for reasons we cover below. The ophthalmoscope is fairly complicated and harder to use than the otoscope. We will cover how to use it effectively in another article. The following models from Welch Allyn will be sufficient to learn how to use a direct ophthalmoscope. The Standard ophthalmoscope is the basic, prototypical version of an ophthalmoscope. This is very common in the clinics and hospital. The Standard model has all you will need to visualize the retina and become proficient with the eye exam. In addition, since this is the most basic model, you will not be at a disadvantage if you learn on this. If you use a more user-friendly model like the Panoptic ophthalmoscope, then you may have difficulty when you need to use a more basic model. Like the Traditional Otoscope, It appears that Welch Allyn is not selling this as part of their standard diagnostic sets, though. It comes with 28 focusing lenses and a variety of aperture/filter combinations. The Coaxial ophthalmoscope is another type of “traditional ophthalmoscope” that looks very similar to the Standard version. This will also be found in clinics and in the hospital. The main difference between the two is that the Coaxial ophthalmoscope utilizes an axis of illumination that aligns with your axis of sight. This means that there are fewer shadows and reflections when viewing the retina. In reality, there is not a huge advantage to this difference; I would recommend saving your money if there is a big cost difference between the two models. That said, many sets being sold these days seem to be featuring the Coaxial version, so you may not end up needing to make a decision between the two. These come with 18 unique aperture/filter combinations and a variety of focusing lenses. Note that there are also a couple of “upgraded” versions of the Coaxial ophthalmoscope that add more focusing lenses and additional filters (AutoStep Coaxial Ophthalmoscope and Prestige Coaxial-Plus Ophthalmoscope) which are not necessary for medical students. The PocketScope ophthalmoscope is a smaller version of the other two traditional ophthalmoscopes. Like the otoscope counterpart, I personally like this model a lot for medical students. 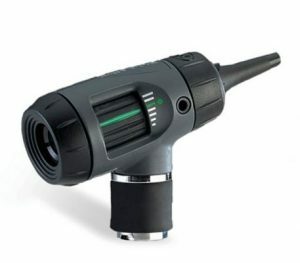 One, it comes with it’s own power source (i.e., if you get the PocketScope Opthalmoscope and Otoscope, they each have a handle, so you don’t need to switch back and forth). Two, it’s small and can clip into your coat pocket, making it really easy to take with you in your white coat. Three, you don’t sacrifice too much quality when trying to visualize the retina. On top of that, it functions very similarly to the other two traditional models, so your skill set will be transferable to the ophthalmoscopes you find in the clinic and hospital. It comes with a 2.5 power handle, halogen lighting, 12 aperture/filter combinations, and 48 focusing lenses. The Panoptic ophthalmoscope is different from the simpler traditional models. The build of the Panoptic is completely different from the traditional versions. With the change in design, Welch Allyn increased the field of view five times greater than the traditional models (25 degrees vs 5 degrees). This makes it A LOT easier to visualize the retina and complete an undilated eye exam at a medical student level. When I first used one I was blown away by how easy it was to visualize the retina and fundus. That said, my recommendation is to pass on Panoptic as a medical student. Here’s why: you want to be able to do a great eye exam with the simpler, more difficult-to-use ophthalmoscopes. For now, the Welch Allyn Standard and Welch Allyn Coaxial versions are by far the most common ophthalmoscopes around the hospital and clinic. You want to be very good at using them. In addition, if you’re good at using them, you’ll be good at using the Welch Allyn Panoptic ophthalmoscope. The reverse is not true. So, for now, I would recommend passing on the Panoptic and saving some money. Definitely check one out (a resident or fellow student will likely have one along the way) — they’re cool, but not necessary for this stage in your training. 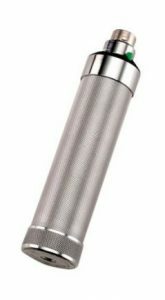 The Power Handles made by Welch Allyn are what you use to grip and power your otoscope and ophthalmoscope. In addition to the two options below, you can also buy a replacement PocketScope power handle if you need one. The Welch Allyn NiCad rechargeable Handle is the simpler of these two models. It is a great choice for medical students. It comes with a rechargeable NiCad battery that charges by plugging the handle into an outlet. This battery works well and will last you 60 minutes — more than enough time to use between charges. The cool thing is that you can convert this handle and use conventional C batteries. So, you can carry some backup batteries with your diagnostic set and be good-to-go if your rechargeable NiCad dies on you. This, in my opinion, makes it a better option than the Lithium Ion version. A marketed downside of this model is that it is heavier than the Welch Allyn Lithium Ion rechargeable handle. Honestly, I like the “heaviness.” It feels more steady in my hands. I wouldn’t let the weight difference between the two be a major deciding factor. 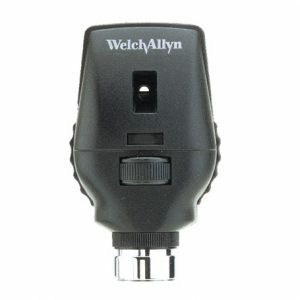 The Welch Allyn Lithium Ion rechargeable Handle is more expensive than the NiCad counterpart. The Lithium Ion battery also lasts twice as long at the NiCad between charges — 120 vs 60 minutes. That’s good, but unfortunately this model cannot be converted to use a C battery. So, you’re essentially choosing between longer rechargeable battery life or the ability to use C batteries. As previously mentioned, this model is also lighter than the NiCad version. Welch Allyn refers to the light bulb that provides the light in the ophthalmoscopes and otoscopes as the lamp. There are two types for the 3.5V power handles: 3.5V Halogen HPX and the 3.5V SureColor LED. The LED version is significantly more expensive the the Halogen, and is not necessary. That said, the LED lasts much longer than the halogen and provides a brighter, whiter light. Keep in mind that you can always swap one bulb for the other if you want to switch when one burns out. As a medical student, I would go with the less expensive option. You can get an insufflator bulb to attach to your otoscope. These sent a puff of air out of the otoscope into the ear canal to test the mobility of the tympanic membrane. The use of an insufflator bulb is the gold standard in diagnosing an otitis media (ear infection). These are not expensive to buy, but as a medical student you most likely won’t be required to buy one. Don’t feel obligated, but it is good to practice using one. These are the tips you put on the end of your otoscope. There are a ton of disposable specula in the hospitals and clinics for you to use. These work fine for medical students and everyone else in healthcare. You can grab extra to have on hand and practice with. If you want to invest several dollars in reusable specula, you can cut down on waste and potentially see a little bit better. Some doctors swear they’re better than the disposable sort, but I haven’t personally tried them. Definitely not necessary to buy specula to learn the ear exam. Buying a diagnostic set (otoscope, ophthalmoscope, and powerhandle) is usually less expensive than buying the pieces individually. You’ll also get a nice case to store/carry your equipment. Sometimes it is difficult to find the precise combination of ophthalmoscope, otoscope and power handle that you desire; the sets below are relatively easy to find at this point. That said, these three sets great: you will certainly have one of the best otoscope and ophthalmoscope for medical students. Note that Welch Allyn appears to be phasing out the Standard Ophthalmoscope, but if you can find it, you can save some money by buying it. This is a great, basic diagnostic set. These are extremely high quality diagnostic tools, and you will not be spoiled by using a PanOptic ophthalmoscope (you’ll also save a good amount of money). This is likely to be the most common set that your fellow medical students buy. For now, there are still some of this set being sold. According to Welch Allyn’s website, though, they are no longer manufacturing this set. This is a great option if you’re trying to save money. This comes with the PocketScope Ophthalmoscope and Otoscope; each has its own power handle. They use a 2.5V power handle, halogen lamp and run on AA batteries. This won’t be as popular as the more traditional diagnostic sets above, but it is more than sufficient to learn the eye and ear exam and you’ll save a good amount of money if you get one.